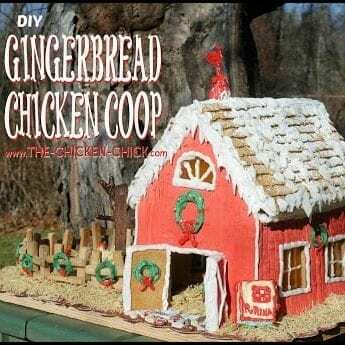 Home Home & Garden DIY/Projects Gingerbread Chicken Coop Instructions with Video Tour! 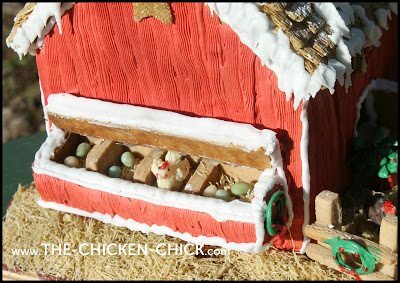 By popular demand, I am sharing details about making my Gingerbread Chicken Coop. 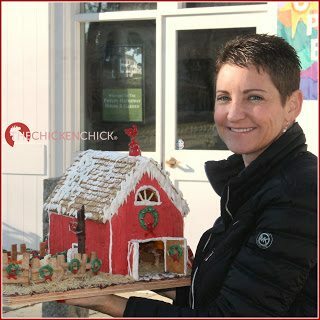 I decided to enter a local Gingerbread House contest three days before entries were due. I began decorating mid-afternoon on Friday, finishing at 3:30 am and could have fussed over details for several more days. At some point during the process, while wondering aloud whether to add a particular detail, my 9 year old threw down the gauntlet, saying “Mom, go big or go home.” Game ON! I was all in. 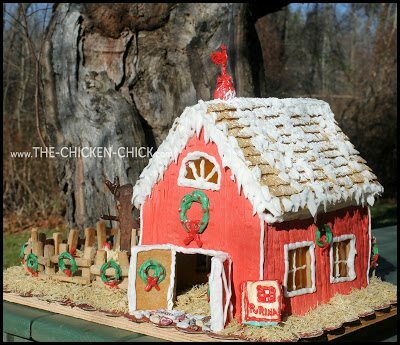 This was my first attempt at a gingerbread house, so take the info for what it’s worth. I made it up as I went along, piecing together recipes and techniques from all over the place while punting the rest of the way. Mr Chicken Chick helped, which was time saving, but he bailed at a reasonable hour of the evening as normal people need sleep apparently. In a saucepan over medium heat, melt Crisco with brown sugar and corn syrup until sugar is dissolved. Remove from heat and cool. In a large bowl, combine flour & sugar & spices. Add sugar mixture & combine. Expect a crumbly, stiff dough that’s difficult to work with. When cool enough to handle, knead until dough comes together. Form into two balls, cover with plastic wrap and allow to rest for at least 1/2 hour at room temp. 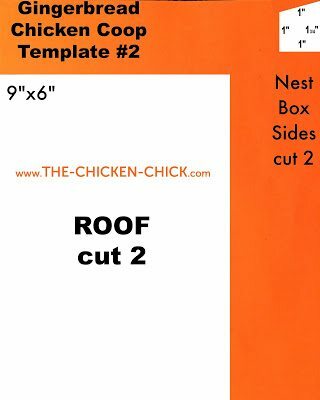 While dough rests, print & cut out the three templates. 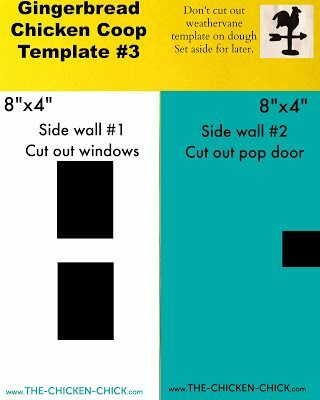 Trace templates onto cardboard or a stiff, file-folder type paper & cut out. Transfer to parchment paper & bake 12-15 minutes. Roll out dough to 1/4″. 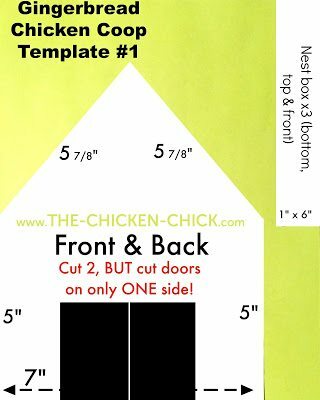 Place cardboard templates on top of dough & cut out pieces with a pizza cutter or large, sharp knife. Unwrap a handful of butterscotch candies, place in a ziplock bag & finely crush. 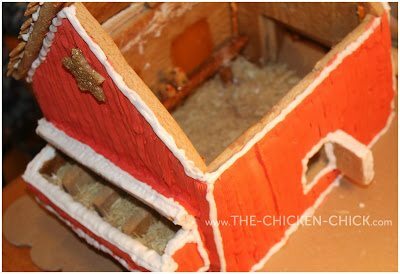 Place cooled gingerbread walls with window openings on a parchment-lined cookie sheet, flat side down. 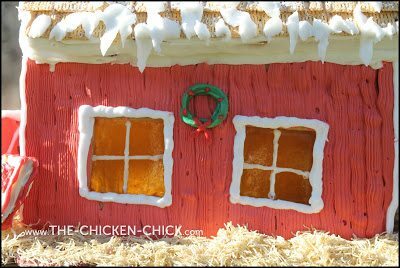 Fill windows with candy shards. Bake in a preheated 350°F oven until just melted. It takes only a few minutes- watch it like a hawk. When melted, remove & cool completely on cookie sheet. 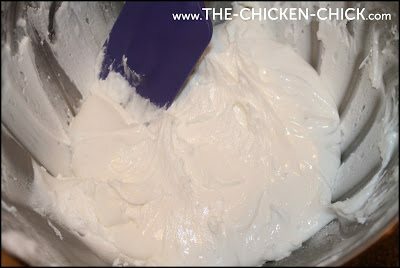 Place sugar and meringue powder in stand mixer and stir at low speed. Add water and mix for 7-10 minutes. Keep covered with a damp paper towel while not working with it. 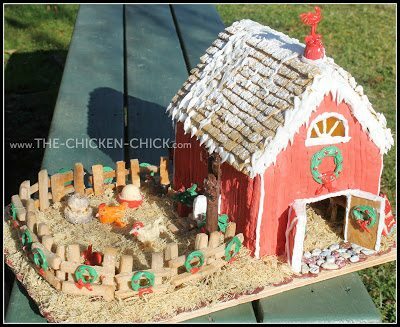 Build the gingerbread coop on a sturdy base. (I used a cake board on top of a piece of plywood cut to size. 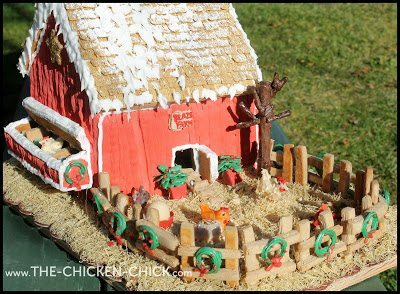 )Identify the center and front of the coop. Lay the four walls on the board, flat side facing up in their approximate permanent locations. 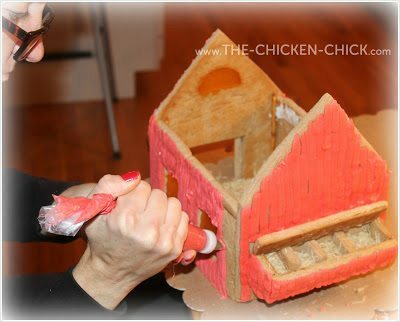 Draw a line of hot glue on the board the length of the front wall & affix the wall upright on top of the glue. 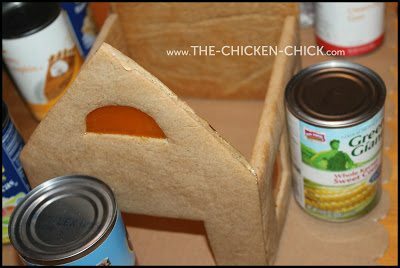 Use cans of food to hold the wall in place. Repeat gluing process with an adjacent wall, gluing seams the walls together. Repeat with remaining two sides. Glue two pretzel rods pieces to floor & glue a pretzel rod to the top of those posts. 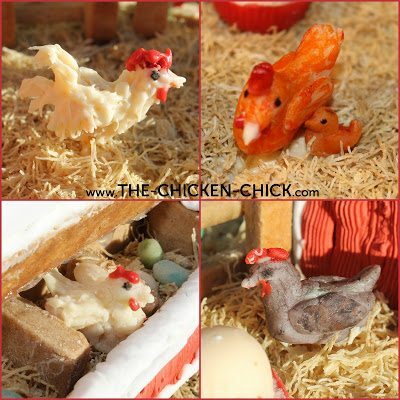 Mold marzipan into chickens, paint with food color gel & glue to roost. 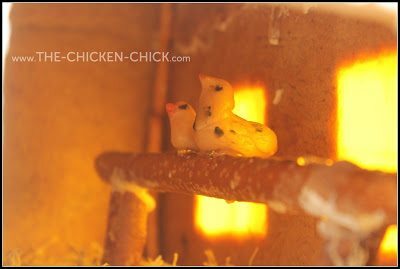 The day of the competition, I glued a battery-operated tea light to the inside of the coop above the roosts to illuminate the windows & chickens from the inside. 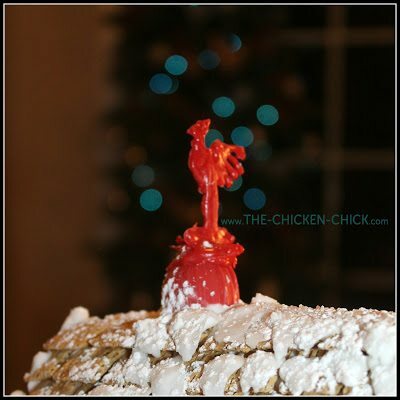 Spread royal icing on floor inside coop, sprinkle crushed shredded wheat on top of icing. And glue 3 nest box divider walls in place. 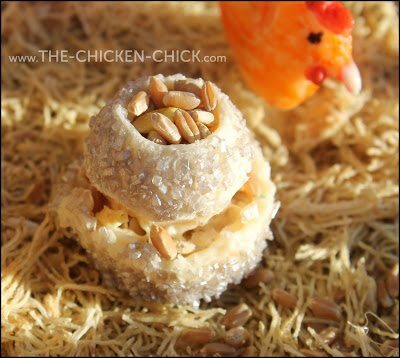 Ice nest boxes white & cover with shredded wheat. 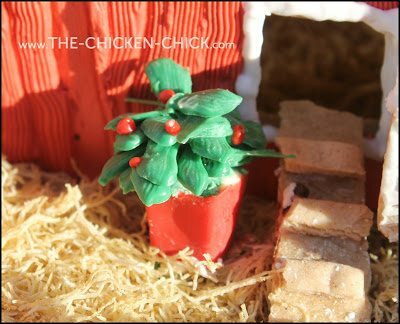 Mix red gel color into some of the icing & pipe onto outside walls with decorating tip #48. Ice from bottom to top. 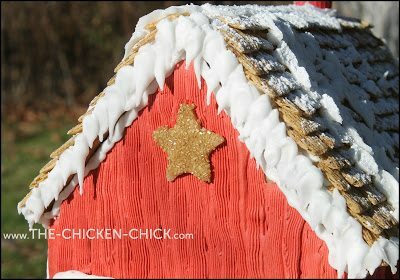 Press barn star into icing above nest box before icing dries. 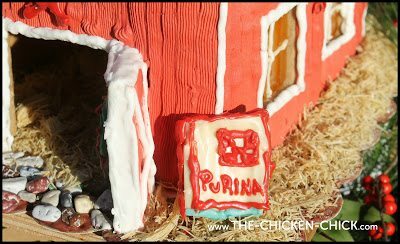 With white icing & tip #12, outline all corners, seams, doors & windows. Pipe Xs on doors & panes on windows. Roll out a small piece of marzipan & cut out into shape of a star, dip one side in gold sparkling sugar. Ice a line across the bottom edge of roof panel & affix Life cereal squares side by side. Repeat in rows, overlapping the row above slightly each time. When coop siding is complete, add roof panels with hot glue. Panels with hot glue. With tip #104, pipe melting snow onto roof ridge, down roof randomly & along front of roof. 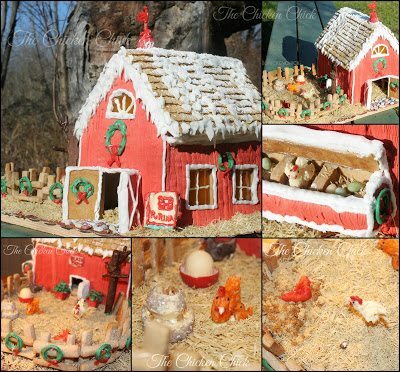 Sprinkle roof with powdered sugar. Tape weathervane template (see template #3, above) onto work surface. 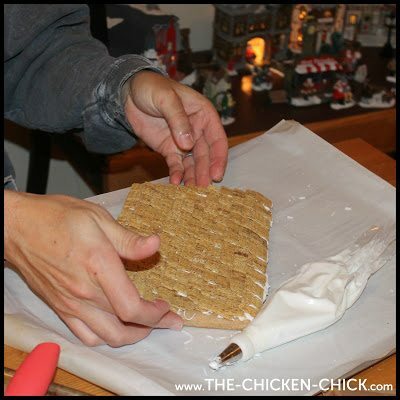 Place parchment paper or wax paper on top & tape in place. Place red candy melts in a small bowl and microwave 30 seconds at a time. Remove, stir and repeat in 30 second increments until just melted. (It shouldn’t take more than 2 minutes total. Careful not to over-heat) Fit decorating bag with tip #5 & pour candy melts into bag. Trace outline of weathervane & fill center. Work quickly before candy melts harden. Candy melts will harden in the piping bag. Remove the metal tip from piping bag & place bag back into the microwave for 15 second increments (shouldn’t take more than one or two). Use a toothpick to clean out metal tip before replacing. 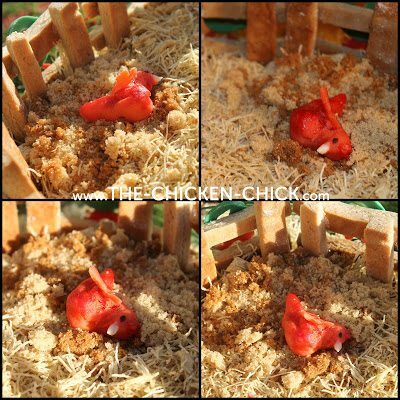 Base=red candy melts in chocolate mold. 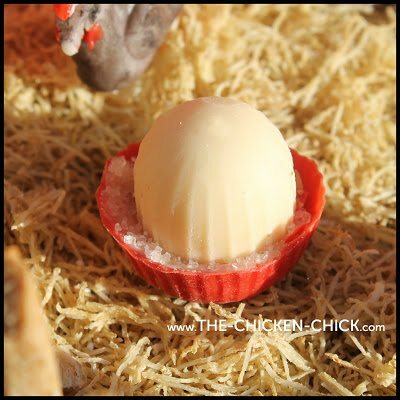 Top=white candy melts in chocolate mold. Water=white decorator’s sugar in base. Top & bottom=white candy melts in candy molds. Carve out centers slightly. Attach top to bottom with candy melts. Fill with real chicken scratch or other grains. 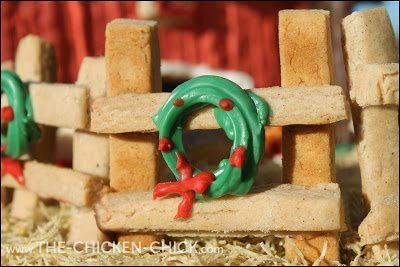 Spare piece of gingerbread covered with white candy melts, red and blue piped on at 3:30 in the morning after hitting the dead-tired wall. Pretzel rod, pretzel sticks dipped in chocolate candy melts. Anchor with green candy melts grass. Green candy melts piped with tip #104 in circles on parchment paper. Red candy melts piped onto green circles with tip #5 I think? 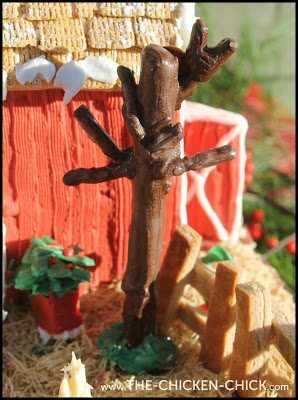 Attach to fence, doors and coop with a dab of candy melts. Marzipan molded by hand, decorated with candy melts or painted with food coloring gel. 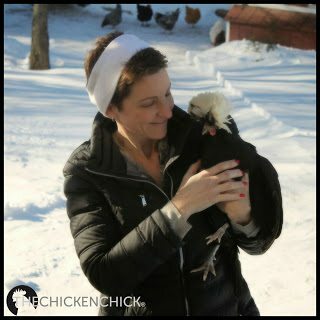 Rooster’s legs=linguine. Attach to base with candy melts. 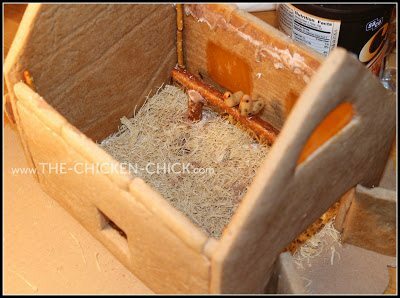 Shredded wheat in bottom of nest boxes. Marzipan eggs colored with food coloring gel. 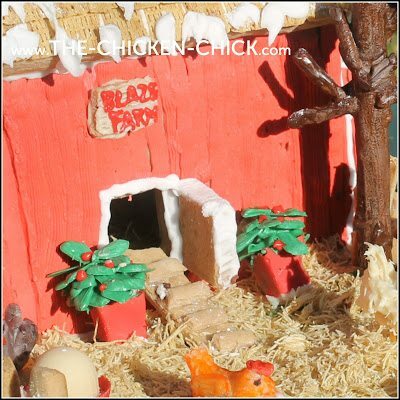 Marzipan hen. Legs=linguine. Sand=dark and light brown sugar. 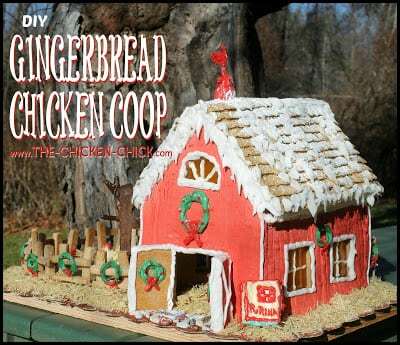 Follow gingerbread chicken coop instructions above OR…get some sleep and buy a Gingerbread Barn Kit at a Tractor Supply store or online at www.TractorSupply.com . Cutest thing ever! Going to give this a try! Wow this is amazing. But I have to admit that I’m shattered just glancing through the instructions!! 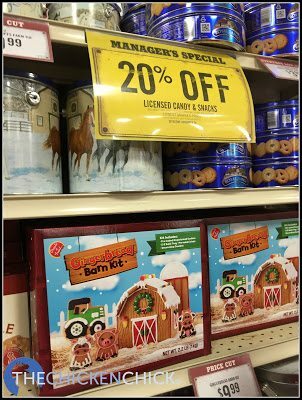 I want one now but we don’t have Tractor Supply here in the UK as far as I know. Hmm, think I may be doing some internet searching in a minute! !